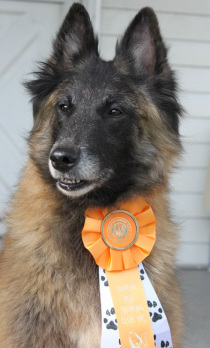 * In January 2015, Amber finished Novice Obedience title (CD) AND earned two legs in Rally Excellent. Congratulations Donna & Amber! * In January 2014, Amber finished her Beginner Novice title AND her Rally Advanced title, AND earned two legs in Novice Obedience. * Amber earned her Rally Novice title in October with a 3rd place and two 2nd places. * Congratulations to Donna & Amber on passing their tracking certification in April 2012. Quite an achievement for a 9-month-old puppy!! * Justice completed her Novice Jumpers Preferred (NJP) title in July. She is one leg away from her Novice Agility Preferred (NAP) title. 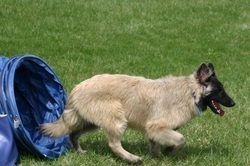 *Justice has been training in agility and made her trial debut on April 13. She qualified in Novice Standard Preferred, but an off-course cost us a Q in JWW (Justice swears there was a vacuum cleaner in that tunnel -- it sucked her right in! :-)) I was very proud of her attempt, and we had fun! * Justice completed her Rally Excellent title on January 5, 2013. * Amanda piloted Dragon to two new titles in April 2014, as well as two firsts in T2B Pref. and a Q in Masters JWW! * More congrats to Team Dragon on finishing their OJP title (spring 2013)! * Dragon added another point toward his Championship by going WD and BOW on Friday, January 11, 2013. He was RWD on both Saturday and Sunday. Keep up the good work, Amanda! * In their first conformation show ever, Amanda piloted Dragon to WD, BOW, and BOS for a 3-point major on September 2, 2012. Way to go, Team Dragon! * Third attempt = third and final leg of Aslan's Rally Novice title on March 9, 2013, with another 97/100 score. * Second attempt = second leg of Aslan's Rally Novice title on February 17, 2013. He earned a 97/100, which was good enough for 4th place! * In his first-ever trial, Aslan earned the first leg of his Rally Novice title on January 5, 2013. * Aslan passed his Canine Good Citizen (CGC) test on October 2, 2012. Blitz passed his Canine Good Citizen (CGC) test on August 19, 2012. At 13 months, he was the youngest in the CGC prep workshop. Genesis. Definitions include "a coming into being" and "a beginning". I chose the name "Genesis" for my Belgian Shepherd Dog breeding program for several reasons, one of which is that special feeling of watching a litter of puppies being born--coming into being. I hope you enjoy your visit to Genesis. Feel free to contact me with any questions or comments about this site, Belgian Shepherds in general, or my dogs and breeding program.